These are easy and fun to make – in fact, the kids or grandchildren might want to help make them! This recipe makes six but you can make 12 just as quickly, which is great when cooking for a crowd. Plus the Bacon and Egg Cups are baked in the oven, so you can enjoy your coffee – or Bloody Mary – while they’re cooking!! PS – The next morning I heated a few up in my microwave for about 30 seconds – they were still delicious!! Makes 6 Oven at 400 F 15 – 20 minutes – keep an eye on them! May 2013 — I made these with my grandchildren at our home in the Pocono Mountains and decided that 3 Tbs. of butter and 3 Tbs. of syrup was just tooo much. Of course, as always – it’s up to you. Add as little or as much as you like! 1 1/2 Tbs.butter, melted – previously was 3 Tbs. 1 1/2 Tbs. maple syrup – previously was 3 Tbs. Bake at 400 F for 15 to 20 minutes, until eggs are set and bread is toasted. After 15 minutes, keep an eye on them because you don’t want to over cook ’em – the yolks should be a bit runny. Enjoy! Jason made these this morning for breakfast…loved them. He made scrambled eggs (for the kids) and added some shredded cheese…they were delicious!! Will definitely make these again. 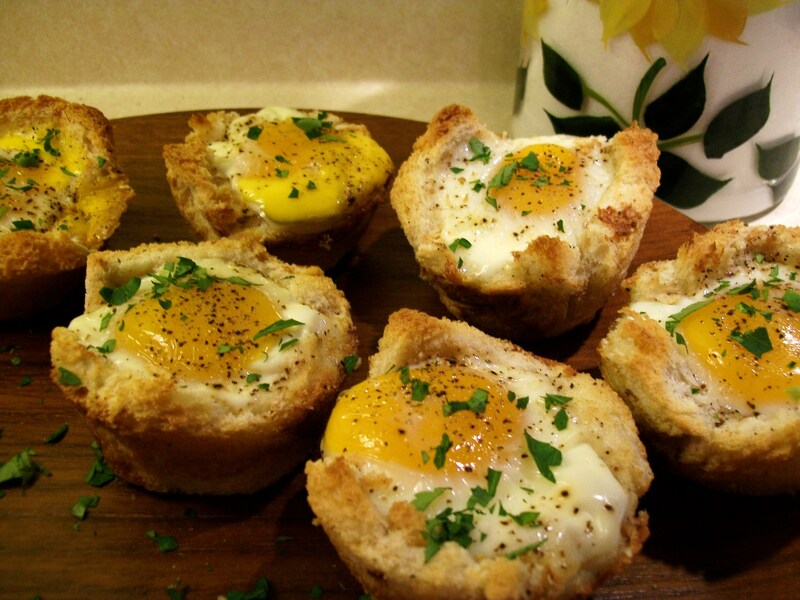 Hi Jen – I’m so glad that you liked the Bacon and Egg Cups – I’m a big fan of them myself!!! I think I’ll have to come over to your house for breakfast – I’d want two of the Bacon and Egg Cups AND some of those yummy-sounding scrambled eggs!!!! I love egg cups! These look delicious with bacon and maple syrup! I LOVE these. Late last night I heated up two in the microwave – and added more maple syrup. I went to bed with “A Happy Tummy”!! I hope you like them!! Lilly Sue – I thought it was rather remarkable that you had just posted Bacon & Eggs Porter!! As fellow blogger recently posted – Great Minds Think Alike !! I love it already, and I haven’t even made them yet!!! I can’t imagine maple syrup on eggs, but I’ll try anything once. You know, my father told me his mother used to cook eggs in maple syrup for Easter. And – these are really awesome with the maple syrup…. kind of like when you have a plateful of bacon, eggs and pancakes and some of the syrup ends up on the eggs!! Let me know how you guys like this! !